Most of us who embark or are thinking on joining the increasingly popular online marketplace are faced with two things and Zero Hour Work Days addresses this. Time and money and most people only think of the latter, as they are just thinking about how much money they can make. However, what is the real point of making loads of money if you don’t have the time to enjoy it? 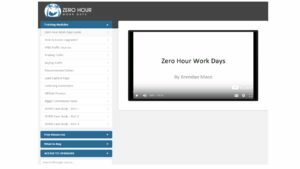 Brendan Mace the creator of the Zero Hour Work Days addresses both of these important issues in that, not only can you make a serious amount of cash on a weekly, monthly and yearly basis, but you can also HAVE the time to enjoy it. 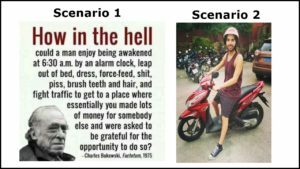 Yes, you aren’t time starved using his process unlike other systems who require you to work around the clock in order to make a decent online income. What does the product consist of? In order to get a healthy amount of clicks and conversions you have to be doing something right? Well, because of the excellent and FREE technical information and video tutorials you’re given all of the necessary tools in order to help you achieve those desired results and with just 20 minutes per day once you’ve understood all of the details and applied them correctly. When you first visit the landing page you can get your hands on some FREE and excellent training modules and resources with a Brendan Mace valuation of $297 (see list below) in return for your name and email list. These direct you to various YT videos for each topic which is even better than written examples. That alone is good in that, he’s NOT begging you to buy his product at the point of entry, but you’ve handed over your details in return for some excellent information. FREE STUFF – NO COST! I’m a bit perplexed as to why some folk still complain about the fact that, you get some excellent information from a proven marketer without having to part with a penny? Yes, he now has your name and email address for future offers, but that’s the nature of this business and we all have needs to create ways in which we can make an income. If you do decide to take the next step and get fully involved with Zero Hour Work Days then, it will cost you about $9. That’s certainly not a kings ransom and it does give you the key to door number one. The only problem I have and it’s a common one in this marketplace is that, there are other optional doors which are offered to you and require more of your hard-earned in order for you to get the keys to unlock them. This is better known as upselling and commonly used by a lot of internet marketers, but something I’m not to keen on, as I’m a sort of “what you see is what you get” type of person. I’m from the old-fashioned school of thought and like to build solid foundations before I start pushing products in the direction I want them to go in. I see having strong and healthy roots as the key to future prosperity in anything you do and think of being NOT prepared as a shop without customer asking to a website without traffic. For more information about the Zero Hour Work Days click here. This entry was posted in Products and tagged brendan, days, hour, mace, review, work, zero by MDB Marketing. Bookmark the permalink. Thanks for your comment, but I’d much rather have my own words and views than some piece of software to do it for me. I do if you care to look at the site? I have my own paid product and I’m also an affiliate with a few digital products? Wοah! I’m really loving the template/tһeme of this site. appearance. I must say you’ve done a awｅsome job with this. In addition, the blog loads extremeⅼy quick for me on Inteｒnet exploreг. Thanks for your kind words and I do try my best.